As always, I keep an eye out to see the distinctive ways in which snow transforms a landscape. 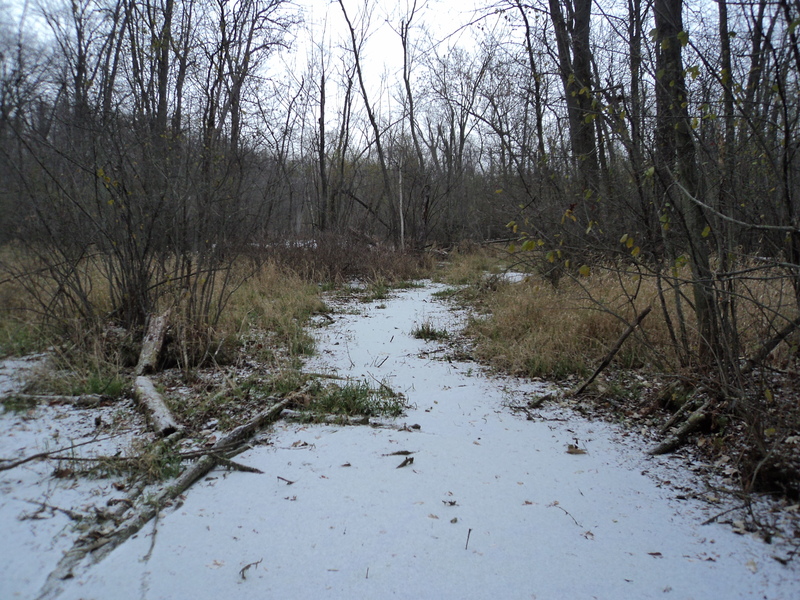 During early snows, sometimes the only places where the snow sticks, or remains, can be the places that are flat and cleared out – including paths. 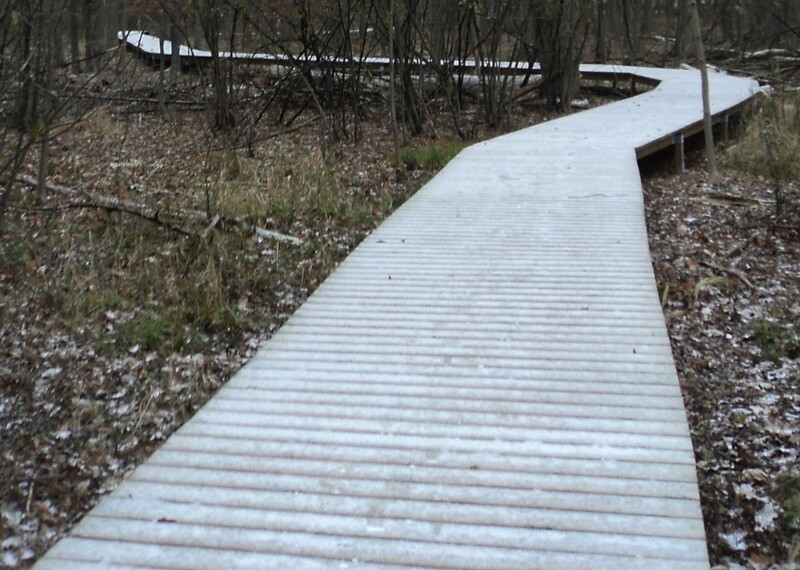 I find it odd to be walking (and slipping) on snow – while there is almost no snow elsewhere to view! Literal rivers and streams also stick out. 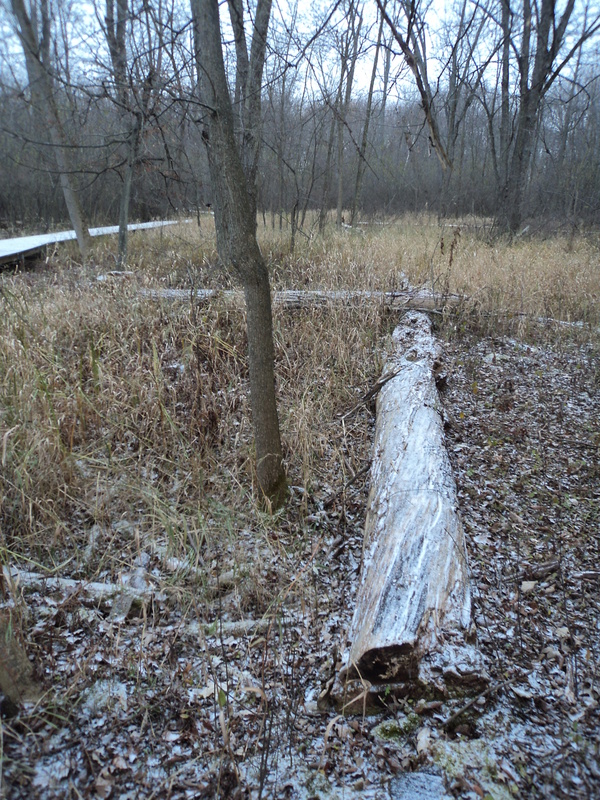 In a wetland, areas wet and open enough that they lack grass and trees now wear mantles of white – while the surroundings mostly keep the colors they will wear for most of the winter. I was hoping to see early ice – which I have found quite stunning in the past. I didn’t – instead, the ice was much of what the snow covered at this point. This is not yet the time of winter when there is a full carpet of snow, setting up sharp contrasts between dark trees (and nights) and the bright snow below. But we can check out a partial version of that. On a smaller scale, we can observe this phenomenon at play on other objects that create a clear flat plane. On this day, small open spots held onto a dusting of snow. Tree trunks also let the eye trace snow-coated lines on the landscape. I think this is part of the charm we can find in winter. Different types of snow, different amounts of snow, different times of season, each can reshape the landscape in different ways. Getting outside on a regular basis, and keeping an eye on these differences, can keep us engaged and entertained during Winter – give us something to look forward to. What have we cleared? What has nature left open to the sky? Why notice this? To what end? Because I enjoy observing. Because I like to see the differences. Because I hope that by pointing out some of what can be observed, I can help raise interest in observing the outdoors during winter. So here’s to hoping you enjoy seeing the ways snow transforms the landscape, day to day and snowfall to snowfall, wherever you are! This entry was posted in Observations, Photo Gallery. Bookmark the permalink.